The Omega Seamaster line of watches has a long and illustrious history. Beginning in 1948 with the dress/sport model CK2518, to the iconic professional CK2913 diver, through multiple other iterations of dress/sport and professional dive models up to the innumerable current offerings. I won’t even attempt a complete history, as that’s the stuff that coffee table books are made of. However, there is one scarcer model in particular that I am quite fond of, and it is that one that we’ll discuss today: The 1970 Omega Seamaster Chronometer Officially Certified reference 166.010. 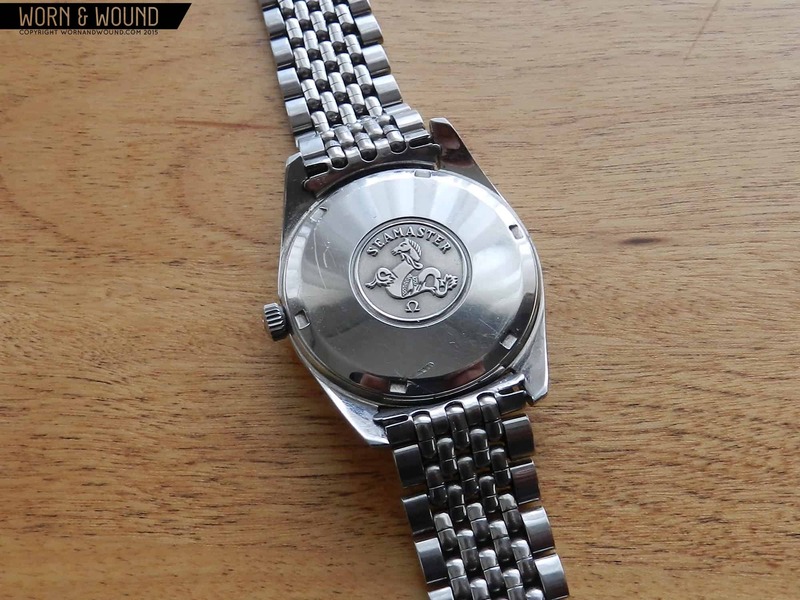 Over the decades, Omega made several different dress/sport model variations that included the “Chronometer” designation with accompanying chronometer rated movement. Most of the 1950’s through 1970’s chronometers made by Omega were in the top end dress watch Constellation line, but they did deign to make some of their Seamasters with these higher end movements. The model discussed today is housed in the reference 166.010 stainless steel case. This case has a more classic “oyster” style to it, rather than the more commonly (and popular) Seamaster cases with the well known “beefy lugs”. The case measures a perfect 36mm wide with 18mm lugs. By this time, Omega had switched from the earlier snap-on casebacks to a more stout screw in back, but still kept the classic seamonster logo embossed on the back. The dial is pure, classic understatement. A beautiful silver with radial brushed finish, steel baton markers with black (onyx I believe) inlays, and a simple framed date window at three o’clock. It has the applied steel Omega logo below the twelve, along with printed script: Omega, Automatic, Chronometer, Officially Certified. That may seem like a lot of text, but it is reasonably small and delicate and done in a cool font; it’s really not obtrusive at all. Lastly, there is the stylized Seamaster script above the six. Dauphine style hands with black line inlays round out the simple, classic and classy look. The only thing that would improve it in my opinion would be no date window, but alas I can’t have it all I suppose. Nevertheless, it is a timeless and understated design that looks just as good today as it did in 1970. The movement beats at 19,800 BPH, with a healthy power reserve of 50 hours. During this era Omega was a true manufacture, making their movements in-house. Later they moved to ETA based movements, which were still good but lacking the caché of in-house. A nice touch on this model is that the date has a true quickset feature. The crown has two detents, the first is for setting the time, and if you pull the crown out to the second detent it will advance the date one day. By clicking the crown between the first and second stops, the date can be quickly and easily advanced as many days as needed. This is a great feature for OCD collectors like me who are compelled to set the date each time I wear any watch. Since I have around 80 watches, any given watch might go weeks or months between time on the wrist, so it’s nice to be able to quickset the date rather than having to move the hands back and forth between nine and 12, like most vintage watches not made by Seiko. While vintage Seamasters are on eBay by the hundreds on any given day, this model is actually fairly scarce. You can find the non-chronometer version of a 166.010 more frequently though. I would say the non-chronometer version in good condition could be found for around $500-750, while the chronometer variation might fetch upwards of $1200 depending on condition and seller. The beads of rice bracelet is going to add around $200 on top of that. Still, compared to the cost of other in-house made Swiss dress watches of the era, these are a bargain. This model is easily one of my all time favorites. With its classic design, chronometer grade in-house movement and perfect dress watch size, this Seamaster just can’t be beat.